We utilize the MS-160 'Davis Rig' manufactured by DiLog Instruments, Inc. to measure licking responses during short-term taste stimulus access. 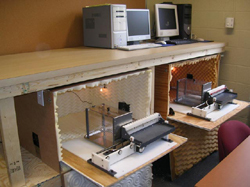 The Davis MS-160 Davis Rig (shown right) allows automated presentations of up to 16 different taste stimuli while collecting measurements of animals' behavioral responses at a resolution of 1 ms. Data analysis programs include examination of cumulative licks, latency until first lick, interlick interval, and rate of licking. 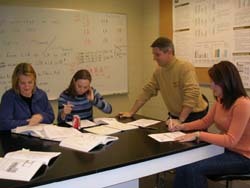 The Davis Rig uses a customized computer program to control the order of stimuli, the time between each stimulus, and the length of the stimulus presentation. 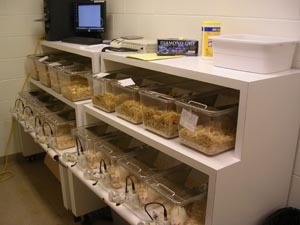 The acoustic isolation chamber housing the Davis Rig contains air circulation fans, a white noise generator, and a web-based camera to allow observation of the animal during testing. A rat waits for the shutter to open presenting a taste stimulus. 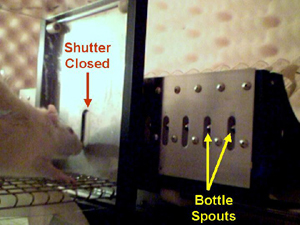 The shutter in the open position allows access to one of sixteen bottle spouts. View a video clip of a rat responding in the Davis Rig. 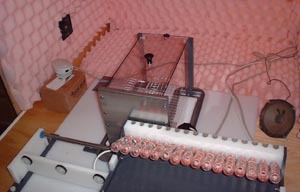 We utilize the AC-108 lickometer manufactured by DiLog Instruments, Inc. to measure licking responses during long-term taste stimulus access. 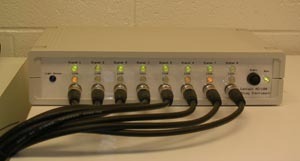 The AC-108 is an 8-channel lickometer capable of recording the licking behavior of rats for up to 24 hours. 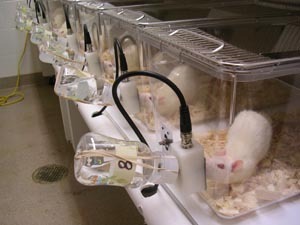 The 8 lickometers can be installed in single cages allowing testing of a single solution for 8 rats at a time or the lickometers can be installed 2 per cage to allow 2-bottle data collection for 4 rats at a time. The time of each lick made by a rat is recorded with a 1 microsecond resolution. Custom software allows microanalysis of the licking behavior. The microanalysis can be used to identify licking behaviors associated with taste-mediated cues such as lick rate and number of licks within a burst or licking behaviors typically associated with post-ingestive cues such as licks per meal and meal durations. View a video clip of a rat being tested in the AC-108. 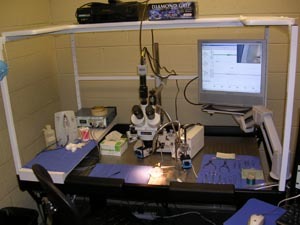 The surgery / histology suite is equipped with three computers, five WiFi laptops, four dissecting microscopes, and two small animal surgery stations. Two externally vented fume hoods provide protection when working with hazardous or volatile chemicals. Two adjacent rooms provide dedicated chemical storage and chemical preparation areas equipped with Mettler balances, micropipetters, mixing & heating stations, double-lock narcotics safe, and refrigeration / subzero freezer access. 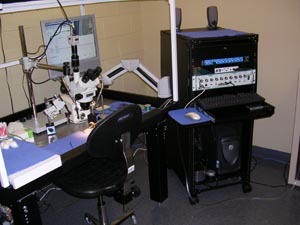 In 2005, a state-of-the-art electrophysiological recording rig was added to the neuroscience laboratory. The system is capable of recording integrated whole nerve responses and single nerve fiber responses as well as multi-unit and single-unit neuron responses in peripheral ganglion or the central nervous system. The electrophysiological recording equipment includes: a floating tabletop, homeothermic temperature regulation, cautery, air turbine drill, aspirator, surgical tools, dissecting scope with camera, microdrive manipulator, differential amplifier, micro1401 & spike digital acquisition system, a DELL CPU, 19" LCD screen with PIP for CPU & scope camera dual display, and a custom stimulus delivery system.